FIGURE 25.6.2.- Below: Angular momentum transferred to the C cloud as a function of the mass processed through this cloud. The transfer of momentum is proportional to the cumulative mass until a saturation is reached, when almost all the momentum is transferred. 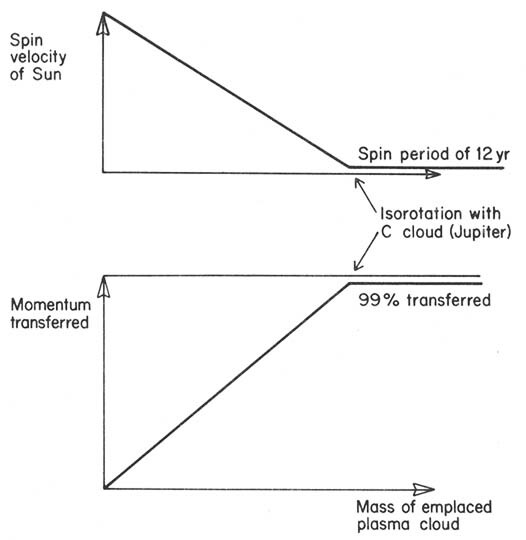 Above: Angular velocity of the Sun after the transfer. When saturation is reached, the solar angular velocity equals the Kepler velocity of Jupiter. If the transfer takes place when the Sun is in the deuterium-burning state with a moment of inertia 200 times the present value, the angular velocity increases by a factor of 200 as the Sun contracts, producing the present spin period (25 days) of the Sun when contraction is completed.